*New Customer first order is down to the lowest price in the county. Compare our prices with your state's average price and see how much lower are Thrifty Propane prices! Thrifty Propane is a Will Call propane supplier. This means that when you become a customer of Thrifty Propane, you save on propane prices, you have no contracts and you can purchase a tank at a reasonable price. It also means you have responsibilities: to place your order at or above 30%, to have alternate fuel supply, such as electric or wood in the event of a weather or supply emergency that delays propane delivery, and to make sure that your driveway is clear so the delivery vehicle can get to your tank and provide markers so we know where your driveway is. When you purchase a pre-buy from Thrifty Propane you are purchasing propane on account to save on the propane prices. Even though we have storage facilities, including multiple underground caverns, we still have to rely on the transportation networks, both pipeline and public roads, to get propane to your tank. Inclement weather or breakdowns at terminals or other points in the supply chain may delay or limit the propane you are delivered. 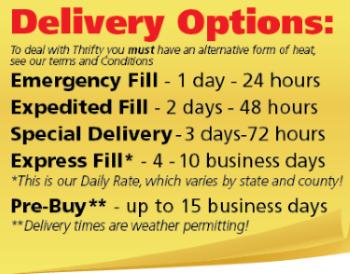 Thrifty Propane target delivery window for each county is published on the website. This means that we expect that we will make your delivery within that target delivery window. Excluded from this are weekends and holidays. Please keep this in mind when you plan your next order. Recent winters have shown that a dealer's ability to deliver the propane you purchase is every bit as important as the price. Dealers that did not think ahead last summer were scrambling for fuel to sell this past winter. The dealers that planned ahead and secured propane supply for the winter months and made sure they had sufficient delivery vehicles on the road were able to supply to supply their customers. Every propane dealer has to purchase propane from “mid-stream” suppliers, just as grocery stores purchase food from distributors. If the mid-stream suppliers short propane dealers on supply, the propane dealers do not have any propane to deliver, whatever deal you may have made with them. The market changed for good in the last two years, never to be the same again. It changed because of fracking, which has created an export bonanza, so that all the propane is leaving the United States by ship, at rates that always go up. The owners of pipelines will have less and less reason to supply American customers, since they will make so much more money abroad. As a result, more and more of the pipeline capacity is going to export terminals, and less and less to terminals that supply American households. This makes it all the more important to stay with a dealer that pays attention to the market and can prepare for each winter before the cold weather comes: that will always propane to deliver to your home. Those that prepare each winter keep propane prices down and supplies steady so you come out the winner. Thrifty Propane has paid attention to the market every year, and has carefully planned its supply every winter. Thrifty Propane has a proven track record of seeing ahead – you heard about fracking in the Thrifty Propane newsletter before it became national news, you heard about the terminals in the heartland shutting down in favor of export terminals before the industry began to brag about export. When you purchase your propane from Thrifty Propane you benefit from our constant vigilance that keeps supplies steady and propane prices down. 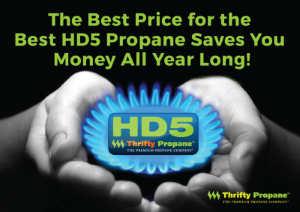 Win the heating game with the dealer that always delivers – Thrifty Propane!